Ideal chicken coop ground cover depends on the environment in which the chickens will live, the type of chicken coop and the number of chickens residing in that coop. Most coops require at least some minimal cover between them and a dirt surface. 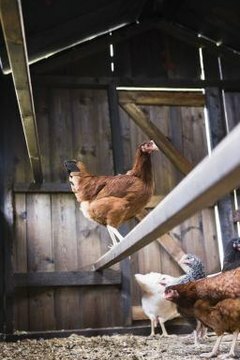 Chickens do not do well in mud, so providing a raised surface or one that absorbs water is ideal. Grass and other types of vegetation are ideal ground covers for movable chicken coops, called chicken tractors or chicken arks. Chickens can forage for insects and worms in the grass. Foraging chickens lay tasty eggs with high nutritional value. Unfortunately, chickens scratch up the ground as they forage, quickly laying waste to the green areas and turning them into dirt patches. When the chickens have eliminated the grass in one area, move the tractor and reseed the dirt with fast-growing seeds such as clover, flax or buckwheat. Your chickens will enjoy this new forage when they rotate back to that spot. Concrete is the ideal surface for a permanent chicken coop. It provides a heavy, solid barrier that prevents predators from digging their way into the coop. Concrete is also easy to clean with a hose and water. However, concrete surfaces can be cold, making it a concern for climates with low temperatures during the winter months. Sand is less expensive that concrete, but it is another easily cleaned surface. Coarse river sand is easy to rake or to sift. Sand dries out chicken waste, making it easier to collect. It also makes composting a bit more simple, since little debris sticks to the waste. The deep litter method of covering a chicken coop floor typically consists of layers of pine shavings being laid down over a dirt floor. Instead of replacing the shavings when the chickens soil the bedding and make it wet, the shavings are simply stirred around and a fresh layer of pine shavings added to the surface. Shavings are only changed once a year, to prevent them from accumulating significantly.